It’s getting to that weather again where it’s warm enough to go out without a coat or jacket, but too cold to go without sleeves or jeans/tights to cover your arms and legs! I love layering and the item of clothing I use the most to wear under tops is this mesh long sleeve from H&M. It’s light enough to wear in this weather but keeps my arms from getting cold at the same time and it can be styled so easily. I’m still loving the velvet trend, always have, always will and so when I saw this cute crushed velvet strappy top I fell in love. The only thing that put me off is that it is quite low cut and slightly cropped so I probably won’t feel confident enough wearing it on it’s own. However, I thought it would look perfect over the mesh top and I think I was right! I love the combination of the mesh and the velvet and they have to be my two favourite materials to wear. So it’s Spring now and the mom jeans are back out! I only really wear them in warmer weather as I find them really hard to style with a jacket. I love that they’re baggy and cropped as it keeps my legs cool when the sun comes out, which is much better than having skinny jeans stick to you in the Summer! I hate to bring negativity to this post but I have to say it, mom jeans aren’t my most favourite fashion-wise. Since I’m quite tall, I feel they make my legs look longer and my body look shorter, especially with the high waist. However, they keep me a lot cooler in the hotter months which is why I wear them! Anyway, something else I live in when the weather is nice are my Old Skool Vans. I do wear them all year round but for some reason wearing them with mom jeans just reminds me of Summer! I think they help keep this outfit casual and comfy, perfect for the nice weather which will hopefully come back soon! Lately I’m loving the look of tees under oversized dresses and that’s exactly why I put this outfit together! This black tee from Primark is so versatile, I can pair it under pinafores, slip dresses, with skirts and for the small price of around £4 it’s an absolute steal. 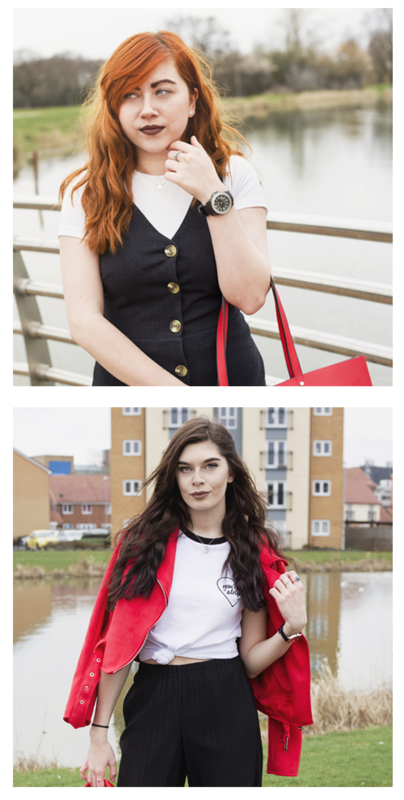 Whenever I’m layering I like the under top to be tight fitting as I personally feel that having an oversized top under and oversized dress/pinafore can look a little messy. Throughout the spring/summer months you will normally find me wearing something floral and this dress is one of my favourite floral pieces in my wardrobe. I actually purchased this in February last year for Rachel’s birthday party and at first I wasn’t so keen. This dress NEEDS to be paired with a belt otherwise it looks like a sack however, I worry that wearing a belt with this dress bunches the material a little, making me look wide and unflattering (I’ll let you be the judge of that one). You’re probably wondering ‘how is this one of your favourite pieces then? !’ well I love the floral pattern I feel that it looks incredibly dainty and girly without being too in your face! Also, I paid the small price of £10 for this dress so as far as I’m concerned it was a bargain piece and I do love wearing it. I’m just a little self self conscious at the moment anyway give it a month or two and I won’t feel so bad wearing it! Do you guys layer your clothing in spring or is that more of a winter thing for you?! We’d love to know your opinion on layering as it’s something we love the look of at the moment. You both look great in the pic. These outfits are so beautiful, and you girlies look absolutely amazing as usual! I especially love that daisy dress!